Have you heard? Oprah is creating her own television network, "OWN: The Oprah Winfrey Network," which will "entertain, inform and inspire people to live their best lives." Debuting in 2009, it's probably not gonna be the suckfest that her previous investment, Oxygen, turned out to be. First of all, it will start off in 70 million homes, since it's going to replace what's now the Discovery Health Channel, which is bad news for fans of documentaries about people with lobster claws, mermaid syndrome, or hearts born on the outside of their bodies. And while Oprah doesn't really focus on physical abnormalities that much, she's definitely into bodily functions. (You just know that Dr. Oz will have his own show on the network, and since O will have full editorial control of programming.) We decided to have a little fun and try to guess what shows will be on OWN. Obvs, because of her obsession with bowel movements — specifically S-shaped ones — we figured that her first show would be The Scoop on Poop. A daytime, round-table discussion, akin to The View, about — what else? — vaginas. Dr. Mehmet Oz will go on travel adventures, and tell us all the gross medical ailments of that location, as well as the healing methods from the region. First episode: Dr. Oz Goes To... Montecito. A real-time reality show that checks in with Gayle King once a day for an hour, as she runs errands, eats pizza, clips her toenails, or you know, clips Oprah's toenails. Oprah reads us a chapter from whatever book she chooses, as our bedtime story, and her sign off for the day. 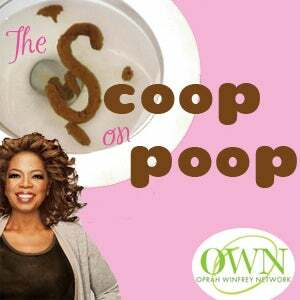 Oprah Asks: "What Shape Should Your Poop Be?"